On Wednesday 20th July 2016, a press conference was held at the Joint Officers Mess for the Special Movie Awards (SMA) 2016. The purpose was to sensitize the general public about this brilliant initiative, solicit for partnership and to let Film Makers know the closing date for the submission of application forms. 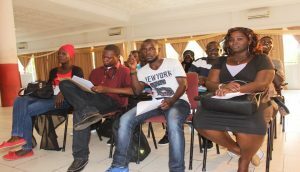 The Conference was attended by the Committee Members of SMA and of about nine (9) Press Houses both Print and Electronic Media such as Standard Newspaper, Observer, The point, West coast Radio, Hot Fm and more. • Where and when can one vote? • When are submissions due? • What is the submission process? After all the matters and questions from the press was digressed by the committee members which included The Producer Sheikh Tijan Sonko, Program Coordinator Franklin Adim, Admin Secretary Isatu M. Bokum, Assistant Admin Secretary Binta Janneh , Financial Secretary Bankole Browne, and The Committee Adviser Amadou Sillah, the next press conference to be held on the 8th of August was disclosed. All the press Members are urged to join as that’s when most Concealed matters regarding the awards will be revealed. A special thanks goes the Executive Producer of SMA and CEO of Afrinity Productions, Mr. Wilfred Adams for powering the Maiden Edition of Special Movie Awards 2016, Afrinity Productions Technical Crew Adams Orukpe and Ayisatu Aiyegbo for covering the event, The Press members and Special Movie Awards Committee and everyone that was present at the conference.